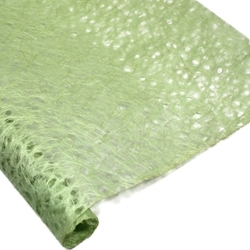 The Spring Green Japanese Ogura Lace Paper is made from 100% Manila Hemp. The long fibers are separated by the "falling water" effect on the newly formed sheets to create holes within the paper. This luxurious paper is the strongest lace paper. Japanese Ogura Lace Paper is machine-made from 100% manila hemp. To form the distinctive lace pattern, the long fibers are separated by the "falling water" effect on the newly formed sheets to create various holes withing the paper. Ogura Lace Paper is perfect for scrapbooking and other projects that require acid-free paper.Use the Ogura Lace Paper for Invitaions, Notecards, Collage, Framing, and more!